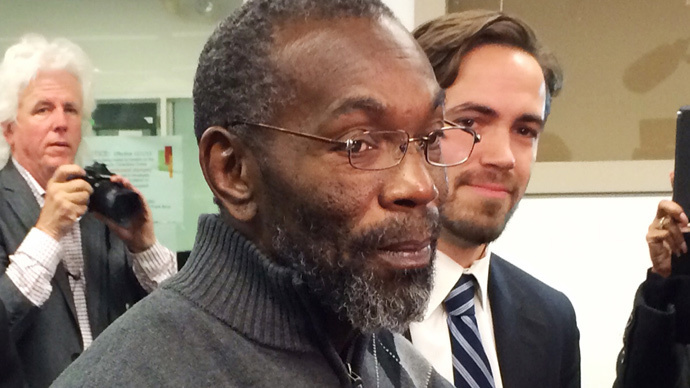 Ricky Jackson, who spent 39 years in jail for a murder he did not commit, is suing the police officers who allegedly helped frame him. Jackson was convicted on the testimony of a 12-year-old boy who didn’t see the crime and later retracted his statement. The lawsuit, which was filed on Tuesday against the city of Cleveland, alleges that eight officers, including detectives and their superiors, were involved in framing Jackson and brothers Wiley and Ronnie Bridgeman for the killing of salesman Harold Franks, which occurred in the Cleveland area in 1975. Three of the officers involved in the case have since passed away. "This lawsuit seeks compensation for that grievous injustice," attorney Jon Loevy said in the statement. "We now know substantially more about the fallibility of eyewitness identifications. Too many people have been sent to prison wrongfully based on bogus identifications." Jackson, now 58 years old, was exonerated of the murder in November and was awarded just over $1 million in March as compensation for the decades he spent in prison. The case was overturned after Eddie Vernon, who was 12 at the time, retracted his statement four decades on. He said he did not even see the murder being committed, as he had been riding on a school bus at the time. The seventh-grader was told by a school friend that “Ricky,” “Buddy,” and “Bitsey,” were responsible. The friend, Tommie, had not seen the incident either. Eddie told the police who he believed committed the crime and “things quickly spiraled out of control,” the lawsuit states. Eddie was questioned by police without a parent or guardian present. He later retracted his statement, saying he did not know who had committed the murders. “The defendants told Eddie that he was lying and threatened to put his mother and father in jail if he backed out. Eddie was scared, did not understand what was happening, and began to cry. Eddie’s mother was sick at that time, and the prospect of her going to jail was very scary to him as a 12-year-old boy,” the lawsuit added. The document also says that the police helped to fabricate Vernon’s trial testimony, as well as investigative reports. Following his arrest, Jackson was allegedly subjected to beatings from the police officers. Two detectives "repeatedly put a phone book on Mr. Jackson's face and other areas of his body and hit him through it so that it would not leave any marks," the statement added. Jackson was sentenced to death by the electric chair; however, this was later commuted to life imprisonment. “On information and belief, Mr. Jackson’s 39 years of wrongful incarceration is the longest ever served prior to exoneration in the history of the United States. “In serving almost four decades behind bars, Mr. Jackson was wrongfully deprived of his entire adult life to date. Imprisoned at age 18 and released at age 58, Mr. Jackson must now attempt to make a life for himself outside of prison without the benefit of the decades of life experiences which ordinarily equip adults for that task,” the statement concluded.